Since being founded in 2000, CuraDebt has professionally helped consumers across the US with consolidating both their unsecured debt and tax debt. CuraDebt is a debt relief service founded in 2000 that offers debt consolidation, debt management, and tax debt services to clients nationwide. Their pricing and availability varies by state. Currently only 37 states are eligible: Colorado, Connecticut, Georgia, Idaho, Illinois, Kansas, North Dakota, New Hampshire, South Carolina, Vermont, Washington, Wisconsin, and West Virginia are not eligible for CuraDebt's services. CuraDebt works with unpaid taxes, IRA rollover issues, audits, tax liens, wage garnishments, back taxes, business taxes, personal taxes, and more. One of their outstanding features is that they provide debt relief to those ensnared by payday loans. The company uses a three-step process for tax debt relief: during your free initial consultation, they get a detailed grasp of your finances. Next, they gather all the necessary documents and prepare your tax return before implementing the tax solution. If you live in an eligible state, you can get a free initial consultation by filling out an online form or calling CuraDebt. In order to qualify for their services, you must have at least $7,500 in debt, including credit cards, unsecured personal loans, collections, and payday loans. Top industry accreditations: CuraDebt is a member of the US Chamber of Commerce, the AFCC (American Fair Credit Council), the IAPDA (International Association of Professional Debt Arbitrators), ASTPS (American Society of Tax Problem Solvers), and the NATRC (National Association of Tax Resolution Companies). The IAPDA trains and certifies debt arbitrators, while the AFCC ensures that the debt consolidation company upholds FTC regulations. Top rated service: CuraDebt has been rated #1 or in the top two companies for "Best Debt Relief Companies" for 9 years by Top Consumer Reviews and they are also rated #1 for "Tax Relief" by Top Consumer Reviews. Low fees: CuraDebt has fees of around 20% of the total debt, which is lower than many of their competitors. Extra educational services: They provide a blog with educational articles on various financial topics, including debt relief, tax debt relief, bankruptcy, and more. CuraDebt offers a refund policy. Wide variety of services: This includes tax debt relief, debt consolidation, and debt management. Experienced team members: CuraDebt's team has over 100 years of experience resolving tax issues. They include tax professionals, state tax experts, certified public accountants, and tax attorneys with 60+ years of experience. Two of their agents were formerly employed by the IRS. CuraDebt's counselors are experienced, qualified, and have backgrounds in financial planning, business, and more. All debt relief services are managed in-house. At the moment, CuraDebt is only available in 37 out of 50 states. They do not provide services Colorado, Connecticut, Georgia, Idaho, Illinois, North Dakota, New Hampshire, Oregon, South Carolina, Vermont, Washington, Wisconsin, and West Virginia. They are not accredited by the BBB (Better Business Bureau). CuraDebt's website does not provide a whole lot of transparency in regards to their tax services, refund policies, pricing, and fees. CuraDebt gives its new customers a free initial consultation with a debt relief expert to determine whether or not debt relief services are necessary. If you are pursuing debt settlement, CuraDebt collects payments from you and puts them in an FDIC-insured settlement fund that is used to pay off your debt in a single payment once your debts are negotiated. During this process, you are still held responsible for your debts. In the case of tax debt relief, you receive assistance from CPAs, enrolled agents, and tax attorneys. Tax debt lower than $25,000 has a flat initial investigation fee of $950. Anything higher will cost more. You must have over $7,500 in debt to qualify. If you have less, CuraDebt encourages you to pay it off using a personal loan. Their fees are 20% or less of your total debt, and you are only required to pay once their case is settled. You will usually save around 30 - 50% of your total enrolled debt. 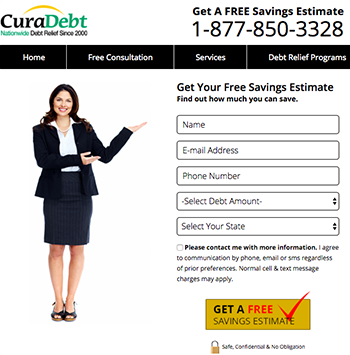 On average, CuraDebt’s debt consolidation program lasts from 2 to 4 years. The minimum debt needed to enroll is $7,500. Your fee depends greatly on several factors, such as your total enrolled debt and the amount of money you can put towards monthly payments. The average fee for debt reduction is around 20%. Can CuraDebt help me with IRS and state tax issues? CuraDebt Tax offers solutions for tax issues such as tax liens, wage garnishments, delinquent payroll tax issues, and more. You may contact one of their Tax Account Executives at 1-877-999-0486 for more information.